The Trojans are looking to enter the NCAA tournament, but they first need to go through the MPSF conference tournament. Los Angeles, Calif. — After a hard-fought five-set win against UCLA (19-25, 25-15,14-25, 25-20, 15-11) last weekend, the No. 5-ranked USC men’s volleyball team prepare for their debut in the Mountain Pacific Sports Federation quarterfinals against No. 15-ranked Grand Canyon University on Saturday, April 13th. The Trojans are 3-3 against Grand Canyon in the all-time series and hope to push the record in their favor this weekend. 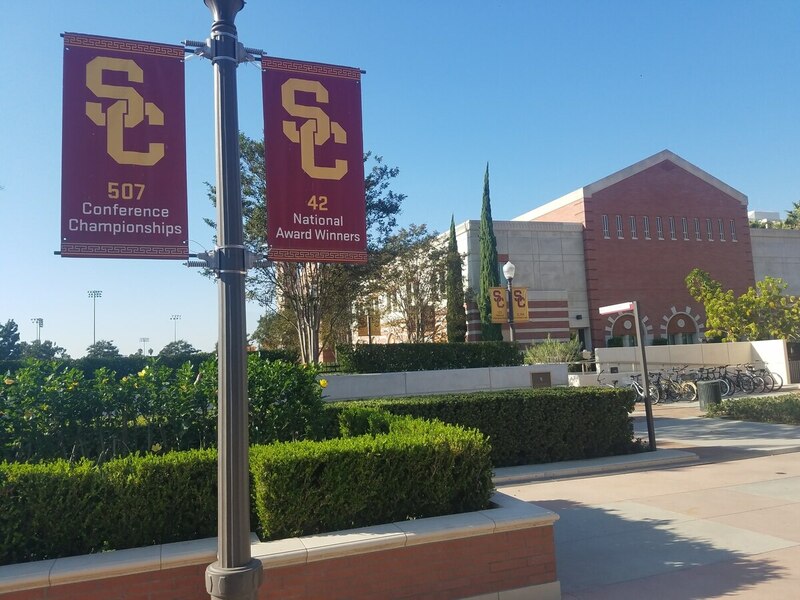 USC has enjoyed a positive campaign this 2019 season, going 16-9 overall and 7-5 in the MPSF conference. At home, Troy has been unstoppable, defeating fellow Southern California heavyweights No. 2-ranked Long Beach State (25-21, 25-21, 25-17) and No. 4 -ranked Pepperdine (25-19, 25-27, 28-26, 25-20) to come away with a perfect 11-0 home record. Under head coach Jeff Nygaard, the Trojans rank third in the MPSF going into Saturday’s quarterfinal match and sport their highest national ranking since mid-2015. Much of the team’s success this season can be attributed to senior co-captains Ryan Moss, Gianluca Grasso, and Jack Wyett, all of whom were honored by the MPSF this past Thursday. Moss, an opposite hitter, was named to the 2019 All-Mountain Pacific Sports Federation first team along with outside hitter Wyett, who celebrated his second year in a row on the conference’s first time. Fellow outside hitter Grasso made the all-conference second team after being awarded an honorable mention last year. Sophomore setter Chris Hall was also an honorable pick this year. USC rely on these players to take down GCU. GCU is ranked No. 15 in the AVCA Coaches Poll and goes into the match against USC with an even 13-15 overall record. Despite recently falling to higher ranked teams in No. 9-ranked Stanford (25-20, 25-14, 25-21) and No. 6-ranked UCLA (25-18, 19-25, 25-23, 25-22), the Lopes were able to beat the Trojans at home (26-24, 22-25, 20-25, 25-23) this past month. In the MPSF, GCU is the No. 6 seed with a less than stellar conference record of 3-9. If USC can pull away with the victory and continue its impressive home streak, it will either face the winner of the match between No. 7 tournament seed Concordia and No. 2 UCLA or the winner of No. 5 BYU and No. 4 Stanford, in the MPSF semifinals on April 18th at top tournament seed Pepperdine. The winners of said semifinals will then battle it out for the MPSF championship title on Saturday, April 20th. With a Trojan defeat on Saturday, USC’s winning streak and postseason action would come to a close, resulting in a 16-10 overall record. USC will look to win and maintain its ranking with the hopes of appearing in the national NCAA tournament, a feat not reached since 2011. If you go, more information here.